Can you help save lives in Turriff? 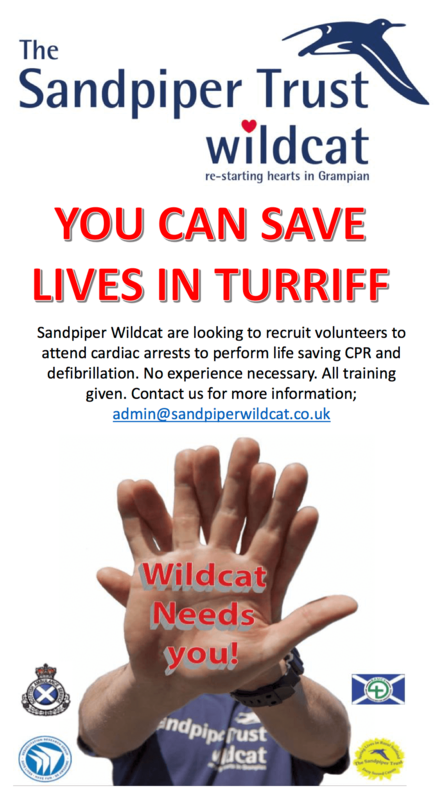 The Sandpiper Trust are looking for volunteers in Turriff to join the Sandpiper Wildcat Project to help provide immediate care to patients who are suffering a cardiac arrest. On average there are 30,000 out of hospital cardiac arrests (OHCA) in the UK each year, in Scotland, there are on average 3,500 per year and across the Grampian area, on average there are 446 per year. For every 1 minute after cardiac arrest occurs, with no intervention, a patient’s chances of survival decreases by 10%. In conjunction with the Scottish Ambulance Service, the Sandpiper Wildcat Project aims to improve survival rates in rural areas by training local volunteers who are available to respond within their local community, providing immediate care to patients and then supporting the paramedics upon their arrival. There are already a small number of Wildcat Cardiac Responder’s in Turriff who have been operational since March this year. In order to extend the amount of cover, there is a desire to recruit further volunteers from within the Turriff Community. It is a voluntary role, and no medical background is required, following a successful application, all training and equipment is provided with regular refreshers being undertaken. Would you like to learn some lifelong skills that could be used to help family, friends or others within the Turriff Community, if you or your organisation are interested, please message the Sandpiper Wildcat Facebook page for further details or alternatively contact Lorna Donaldson on 07732326020 or email lorna@sandpiperwildcat.co.uk.